This item is covered by TechSavers Return Policy. 4. integrated RAID is well supported by Linux. Cons: Expencive for motherboard where H57 chip does just a few things and lots of functionality is moved to CPU. Services: Subsonic, Netatalk(afp), samba, ftp, apache+php+python, transmission, etc. System is cool, quite and fast. 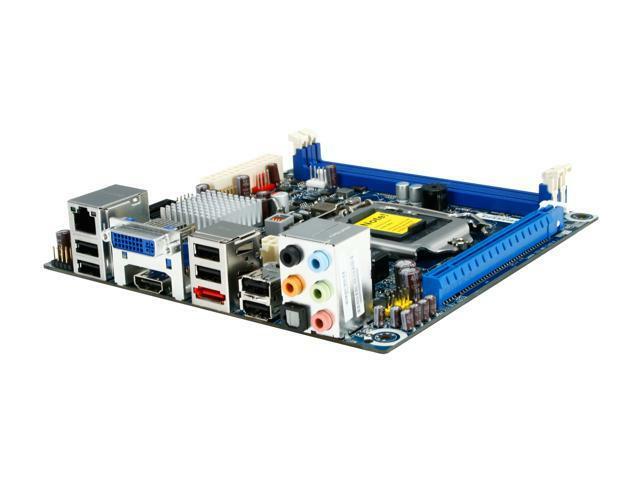 Pros: Feature packed mini ITX board. Good drivers, solid performer. Run i3-530, 8GB Skill Sniper, Crucial 128GB SSD, Lite-On Blu-Ray, Sony 46" 1080P, and XFX HD 5550 in APEX MI-008 case with single 80 mm 20 db case fan. Everything runs nice and cool. E-SATA runs WD Blue 1TB external drive. Other Thoughts: This build is rock solid and a super performer. Makes me want to build the Sandybridge on the new Intel mini ITX board to see what a small case PC can really do. Pros: The board is compact, easy to install and packs a lot of features for its size. Price is great, too. RAID functionality is a plus, as is on-board HDMI. Cons: There are only 4 SATA ports on the board, which makes for trouble if you want to put in a RAID 10. The drives will use up all your SATA, leaving no room for an optical drive. Booted off external USB hard drive and installed from there. Not a big problem, but if I actually want to use an optical drive, it will have to be external, which is a waste of the large space reserved for such a drive inside the case. Other Thoughts: I love this board so far! Pros: Intel Chipset, Graphics onboard with i series processors, fit itx case well. Cons: First board was DOA. Newegg handled the swap well, and the second board was fine. I think the price is a little high at 129, but I see it is now lower at 119. I would have given the board 5 stars if it the first one wasn't doa. Other Thoughts: My board had old drivers for 4 out of 6 items. Intel had a neat automatic update program that worked well. Intel also had a motherboard monitor program that I installed, and really like. My setup was with Gskill memory (8 gigs), and it seems to be working fine. I installed Intel's i3 processor, and like that too. Boots in 35 seconds flat. that's fast. My first itx build out of about 12. Pros: Great for HTPC with bluray playback. Dolby TrueHD and DTS-HD Master are now obtainable without all the hassles needed before. HDMI onboard is a big plus. Love the small form factor.